Shaking it up at JUGS! Hello Friends, We are really shaking things up over at Just Us Girls this week. Not only are we making Shaker cards but we are also adding two new Design team members to our already awesome team. I am tickled pink about both of them!! I have been a huge fan of both of these ladies for a long time now and I consider both of them very dear crafting friends. I have never met either of them, but hope to rectify that some day. I know you all have some of those types of friends too. Crafty peeps are the best peeps if you ask me! The ladies we are becoming our Judy Woodland of Judy’s Happy Place and Bobby Hagen, of Bits & Pieces. Welcome to JUGS ladies and I am once again thrilled to have you joining us! We also still have our Guest Designer Steph Castro with us this month too. 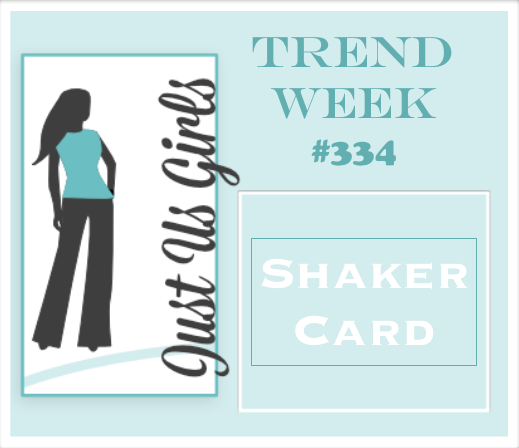 So you gotta head on over to JUGS and check out all the exciting news and see all of the fabulous shaker cards too! My shaker card doesn’t really need any explanation. All products are Stampin Up and my shaker was made with a plastic bag as I have no more acetate. Categories: Cards | Tags: Card making, Cards, Christmas, rubber stamps, shaker card, Stamping Up | Permalink. Great design and neat shaker for Christmas giving. Love the tree too. So creative of you to use a plastic bag for your shaker! That is brilliant! 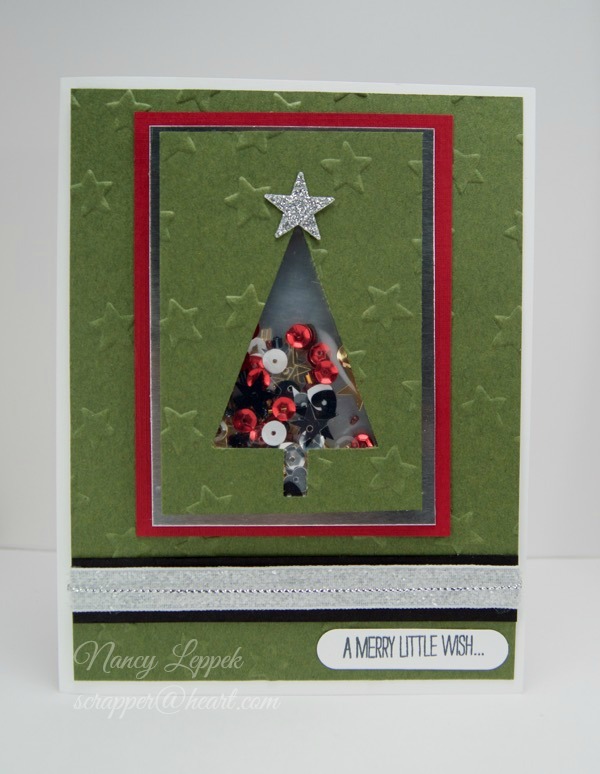 Love the star embossing paired with your adorable Christmas tree. This is beautiful! I too, am thrilled to have another one of my crafty friends join your team. Judy and I have been crafty buddies for sometime. Good to see her here. Are you starting to make Christmas cards for next year? I am jealous and I don’t even want to think about it. But I like you idea of using a plastic bag. That is a good idea. How clever of you to use a plastic bag! I never would have thought of that. Love the shaker Christmas tree….very festive! FAB Shaker Card, love the Christmas theme….1 down 74 more to go lol (but you have 1 more done than I) 🙂 Have fun with Judy!!! Love how you made the tree shape into a shaker and that you used a plastic bag. Very creative and a lovely card. I like how you used the star embossing folder as it goes well with the silver star on your tree. Well, thanks for the warm welcome. I”m so glad to be part of the team. Your shaker card is wonderful, love all the shaker bits inside the tree cut out. Very nice!!! So lovely! That sequin mix is gorgeous. Such a great card! Thanks for the warm welcome, Nancy. I love the embossing for the background of your shaker tree. Well clever you making your shaker card with a plastic bag. Never thought of that…. Great simple fabulous Christmas Shaker. Hi Nancy! I can’t believe this is the first time I have visited your blog!! I am crazy LOL I guess I thought you only had the Sieze the Birthday blog : ) Your card is delightful!! what a perfect die cut to use with for a shaker! I don’t like thinking about winter LOL but you surely are smart to get a jump on those holiday cards! !